Ladakh: His Holiness gave the teachings on Guide to the Bodhisattva’s Way of Life at Shiwatsel ground. 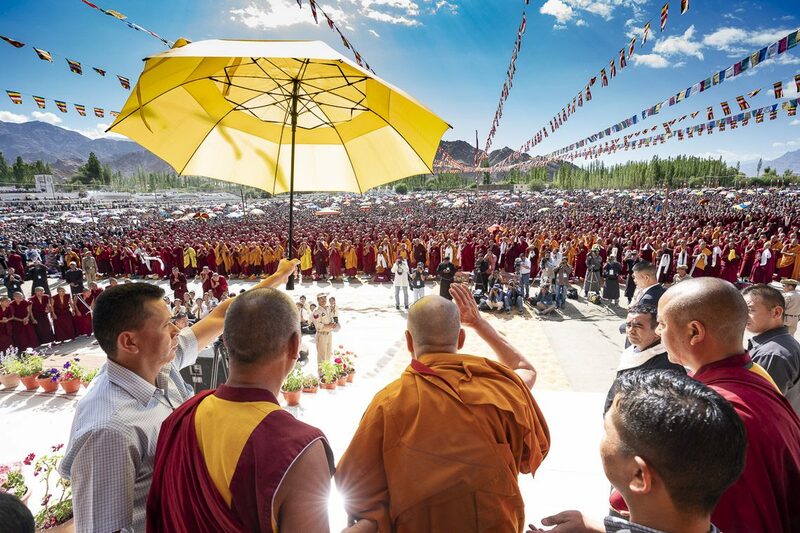 Addressing over 20,000 devotees, young and old, lay and monastic, His Holiness said it is believed that in the 8th century, Shantideva had composed the text for Bodhisattva’s Way of Life and that the teaching represents the great conduct lineage. His Holiness explained about receiving the teachings on Bodhisattva’s Way of Life from Khunu Lama Rinpoche, an ardent practitioner himself. In further delivering on Guide to the Bodhisattva’s Way of Life, His Holiness explained that there are three key components: the manner in which one initiates the practice, the real practice, and completion of the practice. His Holiness also described all the ten chapters of the Guide and referred to chapter six on patience and chapter eight on meditation as the most important chapters. Elucidating on chapter six, His Holiness said if one is to value others more than self, then one needs to overcome anger, and to this end, patience is a virtue. His Holiness continued with an explanation on Chapter eight and said it primarily teaches about equating self with others since caring for self-alone could prove disastrous. His Holiness further explained that to follow the five paths, one needs to be wary of the advantages of following the path and thereby exert effort and overcome deterrents such as laziness and low self-esteem. His Holiness emphasised that one will not be motivated to overcome laziness unless one realizes it as a major impediment. Referring to the 7 billion human beings in the world as seeking material gain His Holiness said that very few aspire to achieve peace of mind. Seeking inspiration from Buddha alone won’t suffice, His Holiness continued, one must make practical effort to achieve real progress. His Holiness will continue with the teachings tomorrow.